Showing off your work is one of the chief pleasures of a successful build, whether it’s a straightforward from-the-box assembly, a kit-bashed original concept, or a ready-built diecast miniature display. We go on about dioramas here at SMN, and indeed, creating a mini-world can set things off really well. However, often enough just one model is the focus of attention, and here a diorama can actually dilute the impressive effect, by taking people’s eyes away from that focus. So, what’s to do? Well, the simple solution is often the best one, and in this case, cheap too - and that’s to stand your model on a mirror. It’s a particularly effective technique for military subjects such as aircraft when they’re loaded with a full-on weapons fit - when of course, all the work you’ve put into drop tanks, bombs, missiles, undercarriage bays and the like can be almost completely hidden by the wings and fuselage. 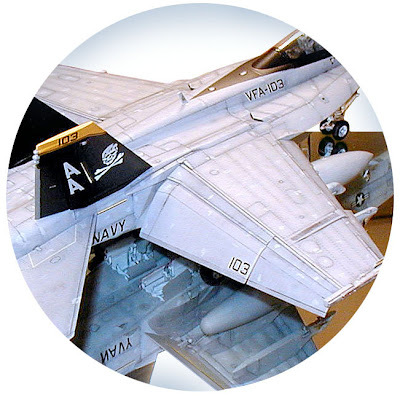 In the picture above, a nicely detailed and weathered F/A-18 Hornet demonstrates how much more you can see with a mirror display - weapons, flaps and pylons are all visible. You don’t have to use a single mirror of course - a neatly arranged panel of mirror tiles will do the job just as well as a single sheet, and are easy to buy from hardware stores. And you don’t have to stop with the ground reflections - a mirrored backdrop allows people to see behind the model, to get a surround view. Mind that glass though - you don’t want to run the risk of breakage, so it’s best to mount the mirror (or tiles) on a rigid backing board made of mdf or plywood, cut to size. A last thought on display is illumination - room lighting is usually from above, throwing the undersides of a model into shadow. So if you can, use a small portable light, angled to brighten things things up down below.